Return pointer to emitter if present. Perform a command on all the selected entries in the list. Definition at line 276 of file llfloatereventlog.h. Definition at line 375 of file llfloatereventlog.h. Definition at line 338 of file llfloatereventlog.h. Definition at line 325 of file llfloatereventlog.h. Definition at line 279 of file llfloatereventlog.h. Definition at line 297 of file llfloatereventlog.h. Definition at line 209 of file llfloatereventlog.cpp. References _PREHASH_ObjectPropertiesFamily, LLMessageSystem::addHandlerFuncFast(), LLUICtrlFactory::buildFloater(), LLPanel::childSetAction(), FALSE, LLUICtrlFactory::getButtonByName(), LLUICtrlFactory::getScrollListByName(), LLUICtrlFactory::getTextBoxByName(), LLUICtrlFactory::getTexturePickerByName(), gMessageSystem, gUICtrlFactory, i, mActionButtons, mActionButtonsType, MAX_INTERESTING_TEXTURES, mEventList, mHiscoreButtons, mHiscoreNames, mHiscoreOwners, mHiscoreTextures, mSelectedTexture, onClickAvatarEject(), onClickAvatarGetKey(), onClickAvatarGohomerSendHome(), onClickAvatarMute(), onClickAvatarProfile(), onClickAvatarTrack(), onClickObjectGetKey(), onClickObjectMute(), onClickObjectReturn(), onClickObjectTrack(), onClickQuickButton(), onClickUUIDBlacklist(), onClickUUIDMutelist(), onClickUUIDWhitelist(), onDoubleClick(), processObjectProperties(), processObjectPropertiesFamily(), QB_AVATAR_EJECT, QB_AVATAR_KEY, QB_AVATAR_LW_GOHOME, QB_AVATAR_MUTE, QB_AVATAR_PROFILE, QB_AVATAR_TRACK, QB_OBJECT_KEY, QB_OBJECT_MUTE, QB_OBJECT_RETURN, QB_OBJECT_TRACK, QB_UUID_BLACKLIST, QB_UUID_MUTELIST, QB_UUID_WHITELIST, QBT_AVATAR, QBT_OBJECT, QBT_UUID, LLUICtrl::setCallbackUserData(), LLScrollListCtrl::setDoubleClickCallback(), LLFloater::setVisible(), LLScrollListCtrl::sortByColumn(), and updateControlsState(). Definition at line 303 of file llfloatereventlog.cpp. References _PREHASH_ObjectPropertiesFamily, LLMessageSystem::delHandlerFuncFast(), gMessageSystem, processObjectProperties(), and processObjectPropertiesFamily(). Definition at line 844 of file llfloatereventlog.cpp. References findEmitterBySelectedID(), func, LLScrollListCtrl::getSelectedIDs(), and mEventList. Definition at line 770 of file llfloatereventlog.cpp. Definition at line 792 of file llfloatereventlog.cpp. Definition at line 347 of file llfloatereventlog.h. Referenced by logEvent(), and logObject(). Definition at line 368 of file llfloatereventlog.cpp. Definition at line 379 of file llfloatereventlog.cpp. Referenced by logAvatarEvent(), and logObjectEvent(). Definition at line 402 of file llfloatereventlog.cpp. References LLPointer< Type >::get(), LLAudioSource::getCurrentData(), getEmitter(), LLAudioData::getID(), mEmitters, and LLParticleEvent::setParticleData(). Definition at line 373 of file llfloatereventlog.cpp. Definition at line 920 of file llfloatereventlog.cpp. Definition at line 913 of file llfloatereventlog.cpp. Definition at line 906 of file llfloatereventlog.cpp. Definition at line 927 of file llfloatereventlog.cpp. Definition at line 934 of file llfloatereventlog.cpp. Definition at line 941 of file llfloatereventlog.cpp. Definition at line 952 of file llfloatereventlog.cpp. Definition at line 967 of file llfloatereventlog.cpp. Definition at line 974 of file llfloatereventlog.cpp. Definition at line 960 of file llfloatereventlog.cpp. Definition at line 1014 of file llfloatereventlog.cpp. References gFloaterEventLog, i, MAX_INTERESTING_TEXTURES, mHiscoreButtons, and S32. Definition at line 986 of file llfloatereventlog.cpp. Definition at line 1002 of file llfloatereventlog.cpp. Definition at line 994 of file llfloatereventlog.cpp. Definition at line 308 of file llfloatereventlog.h. Definition at line 815 of file llfloatereventlog.cpp. References CAMERA_POSITION_OBJECT, gAgent, LLScrollListItem::getUUID(), llendl, llwarns, and LLAgent::lookAtObject(). Definition at line 717 of file llfloatereventlog.cpp. References _PREHASH_Name, _PREHASH_ObjectData, _PREHASH_ObjectID, count, DB_INV_ITEM_NAME_BUF_SIZE, LLMessageSystem::getNumberOfBlocksFast(), LLMessageSystem::getStringFast(), LLMessageSystem::getUUIDFast(), gFloaterEventLog, i, llendl, llinfos, mEmitters, and S32. Referenced by LLFloaterEventLog(), and ~LLFloaterEventLog(). Definition at line 744 of file llfloatereventlog.cpp. References _PREHASH_Name, _PREHASH_ObjectData, _PREHASH_ObjectID, _PREHASH_RequestFlags, DB_INV_ITEM_NAME_BUF_SIZE, LLMessageSystem::getStringFast(), LLMessageSystem::getU32Fast(), LLMessageSystem::getUUIDFast(), gFloaterEventLog, llendl, llinfos, and mEmitters. Definition at line 313 of file llfloatereventlog.cpp. Definition at line 346 of file llfloatereventlog.cpp. References LLFloater::close(), LLView::getVisible(), gFloaterEventLog, llendl, llinfos, and show(). Referenced by LLShowFloater::handleEvent(), and LLToolBar::onClickEventLog(). Definition at line 319 of file llfloatereventlog.cpp. References LLPanel::childSetEnabled(), LLPanel::childSetVisible(), EVENT_PARTICLE, FALSE, LLScrollListCtrl::getFirstSelected(), mEventList, TRUE, and type. Referenced by LLFloaterEventLog(), and updateWindow(). Definition at line 473 of file llfloatereventlog.cpp. References ADD_BOTTOM, LLScrollListCtrl::addElement(), count, LLScrollListCtrl::deleteAllItems(), FALSE, gAgent, LLUICtrlFactory::getCheckBoxByName(), LLView::getName(), LLView::getParent(), LLAgent::getPositionGlobal(), LLScrollListCtrl::getScrollPos(), LLScrollListCtrl::getSelectedIDs(), LLControlGroup::getU32(), LLCheckBoxCtrl::getValue(), gSavedSettings, LIST_AGE, LIST_COUNT, LIST_DISTANCE, LIST_DURATION, LIST_EVENT_ICON, LIST_ID, LIST_OBJECT_NAME, LIST_OWNER_NAME, LIST_SCORE, llformat(), MAX_INTERESTING_TEXTURES, mEmitters, mEventList, mHiscoreButtons, mHiscoreEvents, mHiscoreNames, mHiscoreOwners, mHiscoreTextures, NULL, LLUUID::null, S32, LLScrollListCtrl::selectMultiple(), LLView::setEnabled(), LLTextureCtrl::setImageAssetID(), LLScrollListCtrl::setScrollPos(), LLTextBox::setText(), LLScrollListCtrl::sort(), and TRUE. Definition at line 602 of file llfloatereventlog.cpp. References LLButton::getLabelSelected(), LLControlGroup::getS32(), gSavedSettings, i, llendl, llwarns, mActionButtons, mActionButtonsType, MAX_INTERESTING_TEXTURES, mHiscoreButtons, QB_COUNT, QBT_AVATAR, QBT_OBJECT, QBT_UUID, S32, and LLPanel::setLabel(). Definition at line 626 of file llfloatereventlog.cpp. References LLUUID::asString(), LLPanel::childSetTextArg(), f, findEventBySelectedID(), LLScrollListCtrl::getFirstSelected(), LLParticleEvent::getID(), LLScrollListItem::getUUID(), LLPartData::LL_PART_BEAM_MASK, LLPartData::LL_PART_BOUNCE_MASK, LLPartData::LL_PART_DEAD_MASK, LLPartData::LL_PART_EMISSIVE_MASK, LLPartData::LL_PART_FOLLOW_SRC_MASK, LLPartData::LL_PART_FOLLOW_VELOCITY_MASK, LLPartData::LL_PART_INTERP_COLOR_MASK, LLPartData::LL_PART_INTERP_SCALE_MASK, LLPartSysData::LL_PART_SRC_PATTERN_ANGLE, LLPartSysData::LL_PART_SRC_PATTERN_ANGLE_CONE, LLPartSysData::LL_PART_SRC_PATTERN_ANGLE_CONE_EMPTY, LLPartSysData::LL_PART_SRC_PATTERN_DROP, LLPartSysData::LL_PART_SRC_PATTERN_EXPLODE, LLPartData::LL_PART_TARGET_LINEAR_MASK, LLPartData::LL_PART_TARGET_POS_MASK, LLPartData::LL_PART_WIND_MASK, llformat(), LLPartSysData::mBurstPartCount, LLPartSysData::mBurstRadius, LLPartSysData::mBurstRate, LLPartSysData::mBurstSpeedMax, LLPartSysData::mBurstSpeedMin, LLPartData::mEndColor, LLPartData::mEndScale, mEventList, LLPartData::mFlags, LLPartSysData::mInnerAngle, LLPartSysData::mOuterAngle, LLPartSysData::mPartData, LLParticleEvent::mPartSysData, LLPartSysData::mPattern, mSelectedTexture, LLPartData::mStartColor, LLPartData::mStartScale, LLColor4::mV, LLVector2::mV, pattern, LLTextureCtrl::setImageAssetID(), VX, and VY. Definition at line 698 of file llfloatereventlog.cpp. References LLUICtrlFactory::getCheckBoxByName(), LLCheckBoxCtrl::getValue(), NULL, updateControlsState(), updateList(), updateQuickButtons(), updateSelectedEventInfo(), and visible(). Definition at line 363 of file llfloatereventlog.cpp. Definition at line 365 of file llfloatereventlog.h. Referenced by LLFloaterEventLog(), and updateQuickButtons(). Definition at line 366 of file llfloatereventlog.h. Definition at line 368 of file llfloatereventlog.h. 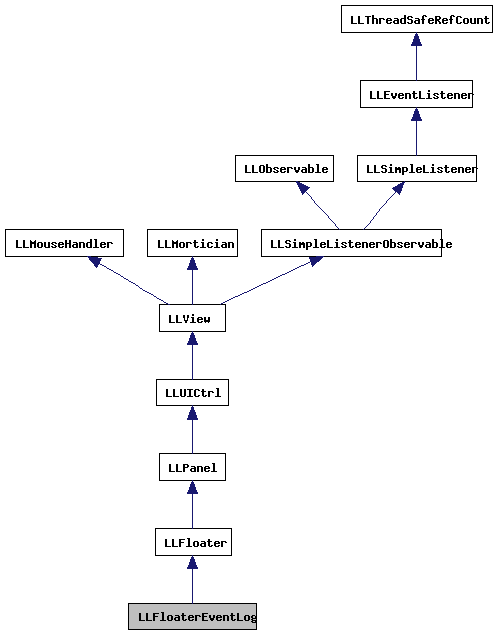 Referenced by findEmitterBySelectedID(), findEventBySelectedID(), getEmitter(), logEvent(), logObject(), processObjectProperties(), processObjectPropertiesFamily(), and updateList(). Definition at line 355 of file llfloatereventlog.h. Referenced by doCommand(), LLFloaterEventLog(), updateControlsState(), updateList(), and updateSelectedEventInfo(). Definition at line 362 of file llfloatereventlog.h. Referenced by LLFloaterEventLog(), onClickQuickButton(), updateList(), and updateQuickButtons(). Definition at line 363 of file llfloatereventlog.h. Definition at line 360 of file llfloatereventlog.h. Referenced by LLFloaterEventLog(), and updateList(). Definition at line 361 of file llfloatereventlog.h. Definition at line 359 of file llfloatereventlog.h. Definition at line 357 of file llfloatereventlog.h. Referenced by LLFloaterEventLog(), and updateSelectedEventInfo().